The photo above was taken at M Resort with their waterfall wall in the background which is near registration. Today started out well with us waking up late but being moved to our new room at Palazzo by 1pm. We were meeting NurseJanet from the Blonde4ever Las Vegas message board and her husband in the early afternoon to go to the M resort as they were kind enough to give us a ride in their car. Since we were running late we went into the Venetian Gold Lounge to grab some coffee and discovered they had recently upgraded their food choices to include chicken skewers and a mini potato skin appetizer, in addition to their usual soup, rolls, cheese and fruit selection. The chicken skewers were excellent and along with the other items were perfectly fine so we skipped having brunch at a restaurant. We really enjoyed meeting Janet and Dan, they are easy to talk with and a lot of fun. During the drive to M resort I offered to provide some directions using the GPS on my Iphone, this turned out to be a unlucky decision as it took us about 15 minutes out of our way! Fortunately I called Terri (Socalgirl on Blonde4ever) since she lives near M resort and she gave us excellent directions on finding the correct route back to M.
When we arrived at M resort Terri met us there and after introductions we all split up to gamble. 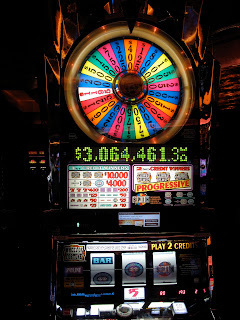 Randy and I had a lot of luck in M resort's high limit room as we hit a spin on the $5 Wheel of Fortune for $300.00 and then on $5 pinball for $350.00. We then left the high limit room and went off and tried various penny slots from Kitty Glitter, Ruby Slippers, Goldfish,Wolferton,Wicked Winnings II and numerous other video slots and just lost on all of them. After losing all but a couple hundred of our winnings we returned to the high limit room where hit another spin on $5 pinball for $400 and then then had hits on Double Diamond and $5 Pinball again until we had won $1000 at M resort! It was then around 6pm so we joined Terri at the M Buffet as we have 2 comp with VIP passes. Since it was Friday night it was their Seafood buffet and there was a huge selection of food. I started out with crab legs and shrimp and while both were good, I like the shrimp and crab legs more at at the Wynn buffet. After the photo of my shrimp and crab I forgot to take anymore of the food until I went and got dessert. One nice feature of the M buffet is the free gourmet coffee selection with liquors and also beer and wine are complimentary. After enjoying the buffet we returned to the slots but our luck had started to change again and we lost $300.00 of the thousand we had won earlier. At 8pm we met Janet and Dan again near registration and Dan drove us back to Palazzo. The four of us decided to have a drink at Palazzo's new Laguna champagne bar which was very busy. Jane and I ordered 2 of the signature champagne drinks and I really liked mine. Terri in the meantime who had left M Resort after dinner had checked into Palazzo, came to join us for a drink. 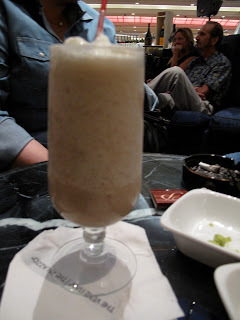 Terri's mudslide was the only drink I got a photo of and she mentioned it was good and strong. After drinks all of us went briefly to the Venetian Gold Lounge where we said goodbye to Janet and Dan who we will see again tomorrow at the Blonde4ever meet at Napoleon's lounge in the Paris hotel. Terri and I on exiting the Gold Lounge decided to each pool a $100 and try our luck there. We quickly hit a Pinball and made a couple hundred and then tried a few more machines hitting one more pinball before we decide to cash out with each of us doubling our money. Terri then took that stake and had a lot of luck the rest of the evening, while Randy and I briefly had some luck on a Wolf Run for a win of $310.00. Unfortunately after that Randy and I went separately to a bunch of various slots and lost. Then we joined back up together and you guessed it, lost. While I did hit a spin on Palazzo's $5 Wheel of Fortune, it ended up being my highest win after the Wolf Run and it was only for $125.00. Pretty soon we found our wins from the previous late night and the rest of today were mainly gone, though at least so far we have been playing on the casino's money. After that we went up to our suite around 1:30am as I wanted to make this post and since I have to get up really early in about 5 hours it's time to stop here. Tomorrow the plans are to go to the Neon Boneyard, brunch at Bouchon, the meet, and dinner at Postrio! A penny slot is just a tad under ten percent house edge. >but high limit slots saved us. You were probably at about 4-5 percent edge there. The M is pretty good so you may have been at an even lower edge. 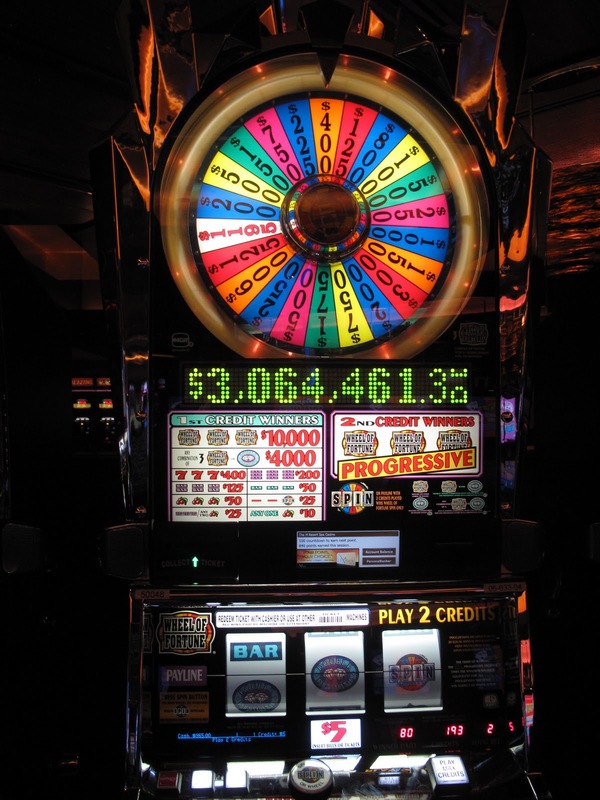 Do you play anything other than slot machines? Hi FoolsGold, I used to play a lot of Blackjack and my husband played both that and VP. However these days due to the stress of work, we just want to relax and not think at all, so slots fit that need for now, plus we love the video slots with bonus games. We have been thinking though of learning craps and playing it now and then, so perhaps on a future trip we will do that. Ah, I know just what you mean!! Well, there is always MiniBacc at 1.06 house edge. Baccarat is the card game equivalent of a slot machine. At the higher denomination non progressive slots at The M Resort you were likely at 3.87 to 5.0 house edge.